The XY-5 core drill rig is a new type of core drill which is developed especially to meet the need of various drilling process mainly in diamond drilling, the power machine of which can either be motor diesel engine. 1) The wider range of vertical drill speed can be set into many gears. 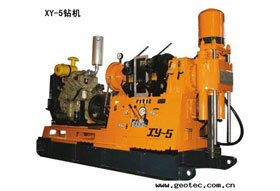 2) Large drilling torque, high strength and strong capacity of drilling. 3) Adopting the connecting rod reinforcement spring cramp, hydraulic loosen chuck which is off normally and carbide inserted pipe slips, the clamping can be with large force, longevity and high reliability. 4) Adopt hydrometric brake, the work is steady, safely, and keep the band-type brake life is long. 5) Choose the high quality general parts such as article brand automobile gearbox, clutch and universal power transmission shaft. 6) There is supervisory system (We install it according to user requirement).It can monitor the parameters as toque, drilling pressure, pump volume, pump pressure, speed and so on. 7) The power can choose motor and diesel engine. We are a professional core drill rig manufacturer and supplier in China. We have gained the recognition of a large number of clients through our 20 years' production experience and marketing and serving experience, and meanwhile we have accumulated abundant experience in terms of products. At the same time, we keep researching core drill rig that can better meet the clients' needs and the market. Our core drill rig has been exported to South America, Africa, East Europe, Southeast Asia, and Middle East. We have clients in America, United Kingdom, France, Canada, Australia, New Zealand, Philippines, Indonesia, India, Chile, Brazil, Russia, Algeria, Morocco, Malaysia, Thailand, Pakistan, Mongolia etc. Located in Wuxi, near Shanghai, the biggest port city of China, we are provided with convenient transportations of any kind, by land, sea or air, which will greatly reduce your transportation cost. To meet the clients' different demands, we can provide all kinds of geological drilling tools, such as diamond core bits (synthetic natural), reaming shells PDC bits, core barrels overshot, drill rods. If you need core drill rig, please contact us.